Memorialisation is an important tool in addressing conflict situations where years of repression, social inequality and injustice have created polarised communities. Memory initiatives can be a great healer and an enabler of reconciliation, paving ways and opportunities for dialogue, understanding, apologising, acknowledging and addressing past violence between divided societies. The change in the political environment in 2015 brought with it a space for such reconciliatory action, and in this respect, the government made promises to establish mechanisms to deal with the past- specifically the 30-year ethnic conflict that ended in 2009. 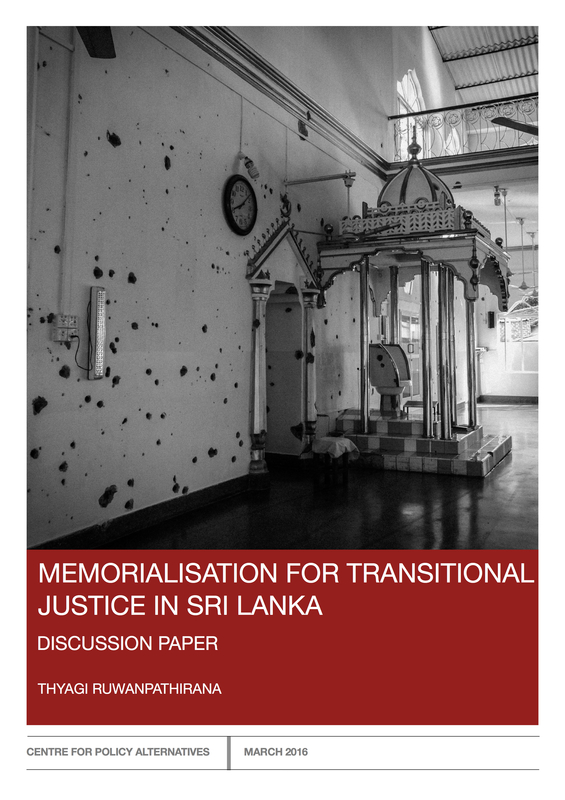 Memorialisation can play a critical role in the government’s transitional justice agenda, specifically in terms of complementary measures that can help reinforce these systems that may take many months to set up. Further, memory initiatives can address grievances that are not captured fully by the structures promised by the government, while bringing together communities who have suffered similar issues such as disappearances, which were common not only during the 30-year conflict, but also during the two Southern insurrections. In light of successive governments’ failures to adopt a balanced approach to memorialisation, and given the crucial role the State can play in either healing or dividing communities further, through national memorialisation initiatives it takes up during their tenure in government, this latest discussion paper by the Centre for Policy Alternatives (CPA) hopes to set out guidelines and best practices governments should adopt in their practice of memorialisation. It also highlights the need to adopt, by way of a National Policy on Memorialisation, a consistent and impartial approach to State practice of memorialisation. This discussion paper is one in a series of policy papers related to transitional justice that the CPA hopes will facilitate discussion around incorporating international best practices in the government’s approach to dealing with the past. Download the discussion paper in full here.